We’ve got some action going on. (Lurker) A third-person, real-time strategy horror game where you control a multitude of units that must escape an underwater lab without being overwhelmed by a hostile test subject. The player has access to multiple units of different class variations that allow unique ways to navigate the area. (The Husker Report) A first person strategy puzzle game where you play as a detective armed with a device that allows her to visit a memory of a person she is interviewing in order to uncover what happened at the scene of a crime, as well as find key elements to determine a bias and seek the truth of the case. (Daisy) A first person survival horror where you play as a robotics engineer that is trying to disable a hostile robotics project thesis during its spasm, while not dying to it. So what’s the deal with these? After this week’s feedback from the class, in addition to a design discipline meeting, we have iterated on these ideas further, and this Monday we will present the results of this iteration. A following post will be right before we present. 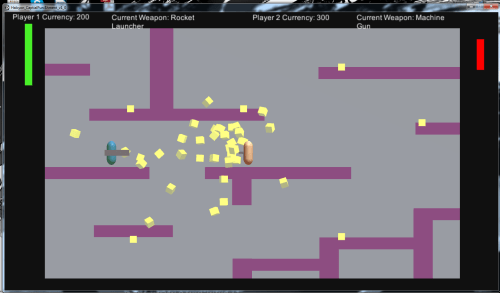 A screenshot of the first version of the first concept prototype (Capital Puni$hment). See you Monday.